Apple’s “iOS in the Car” initiative will be rolling off assembly lines later this year, with a snappy new name to boot. Now known as CarPlay, Apple’s system will first appear in select 2014 vehicles from Ferrari, Honda, Hyundai, Jaguar, Mercedes-Benz and Volvo. A dozen other auto makers, including Ford, Chevrolet, Toyota, and Nissan, have committed to support CarPlay in future models. Apple already offers some car integration through Siri Eyes Free, which lets drivers of compatible automobiles control the virtual assistant over Bluetooth with a steering wheel button. But CarPlay integration is much deeper, allowing iOS to take over the entire infotainment system. Instead of baking iOS directly into the dashboard, car makers will supply a Lightning connector for plugging in an iPhone. The phone then powers the system, letting users get directions with Apple Maps, listen to music, answer phone calls and respond to text messages by voice. A handful of third-party audio apps will also support CarPlay, including Beats Radio, iHeartRadio, Spotify and Stitcher, with more apps to come. All CarPlay vehicles will support voice controls, so users can activate Siri by holding down a button on the steering wheel. Some cars will also have touch screen controls for CarPlay, while others will use knobs, buttons or dials. The system will require an iPhone 5 or newer, running iOS 7. Apple isn’t the only tech giant with eyes on the automotive world. At CES in January, Google announced its own initiative to bake Android into car dashboards, with Audi, General Motors, Honda, Hyundai and Nvidia as partners. Microsoft also offers its own platform called Sync for Ford vehicles, but Ford recently said it would be switching to BlackBerry’s QNX system instead. Apple’s plug-in system may not be as convenient, but at least it can ride on top of existing systems, potentially giving CarPlay much broader reach. 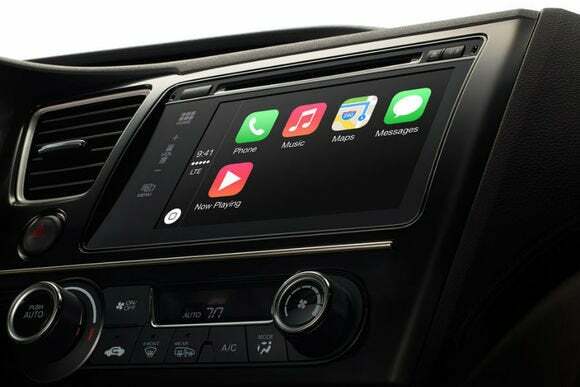 This story, "CarPlay: Apple's in-car iOS dashboard gets real, launching this year" was originally published by TechHive.